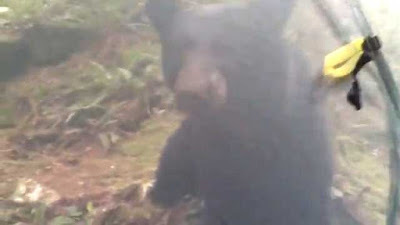 A man from Vancouver, Canada, who survived a close encounter with a black bear while camping last week has shared video of the interaction. David James Weale said he'd needed a little downtime, so he went to the Capilano River Regional Park, hiked down a path and set up a small tent. He was meditating the next morning when he heard sniffing sounds nearby. When he sat up, he came face-to-face with a black bear. "I guess I startled him a little bit and then he came close and just started exploring the tent," Weale said. Weale went back to the campsite on Wednesday, walking barefoot through the woods to the spot he'd been staying. "I was just watching. I made eye contact with the bear and he was just poking around the tent and exploring." The bear was sniffing the thin piece of mesh separating it from Weale, and at one point licked one of the seams. "Hey, no," Weale told the bruin in the 14-minute video he recorded. The bear then pawed at the tent, and he told it "no" again, laughing to himself. The bear then sat down a few metres away and scratched its ear with one of its back feet. It walked around the campsite for about 30 minutes before Weale managed to escape by putting some smoothies outside his tent as a distraction. In retrospect, he says that the smoothies were not the smartest idea, but he felt like it was the only way to keep it busy while he got out. The bear was blocking the trail that led out of the area he was camping in. "I could feel that he wasn't aggressive, he was more just curious, so that's why I didn't get too worked up myself. But it was still an exercise just to remain calm through that whole thing," Weale said. "It was pretty wild." Weale said he was "grateful" to have survived, and that his tent was "a little messed up" from the encounter. According to an expert, Weale was lucky to have survived the encounter unscathed, but that remaining calm may have helped the situation. "Don't run, don't turn your back on the bear," Tony Webb, from the North Shore Black Bear Network, advised. Bears aren't precursory hunters like tigers, but they will sometimes chase a running target. Those who encounter the giant animals should face them, but not stare them down. Looking a bear in the eye for too long may seem like a confrontation to a bear trying to read a human's body language. 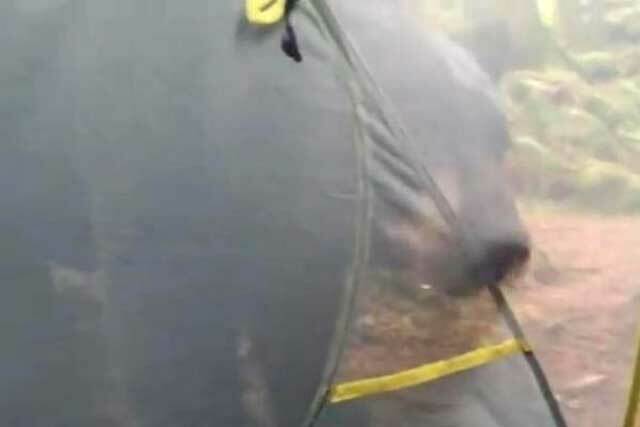 He said the bear may have been drawn to the makeshift campsite by the smell of Weale's smoothies, and anything with a smell should be locked in an airtight container. Campers should also carry bear spray just in case, though most encounters have a "low threat" level, Webb said. People really should be taught to distinguish between a black and a brown bear. While the smaller black bears of the East Coast are capable of doing damage to humans, they rarely do. Encountering bears out West may be really scary, and people might want to back off fast, but if one is calm and cool, he is not likely to get hurt by a black bear. You may very well want to back slowly away from the little black bears, but not often do they attack people.